This November sees the release of the nineteenth novel featuring the curmudgeonly Scottish detective, Detective Inspector John Rebus. Ian Rankin OBE is the author behind this phenomenon. A writer who needs no introduction to his legions of fans, crime readers around the globe, not to mention writers like myself who admire his work ethic, talent and longevity with a degree of disbelief. 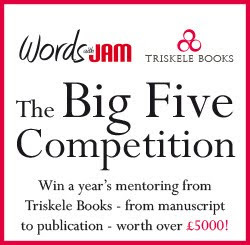 Never before at Words with Jam Towers has the announcement of our next cover slot caused so many ripples of admiration and coos of delight from other contributors, all of whom seem to admire an author who does little to court publicity away from his writing. 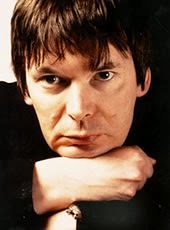 Ian Rankin has been a major contributor to the trend of ‘Tartan Noir’ that has swept through the literary world over the past two decades. And tying in nicely with our theme of ‘Home’ this issue, he has never ventured far from his roots when choosing the perfect location for his work. Since the first Rebus novel ‘Knots & Crosses’ in 1987, he has gone on to achieve worldwide success, with awards, accolades, numerous best sellers – not to mention the occasional television series - to his name. Surely this is a writer who has by now ticked just about every box on his to-do list? When Ian kindly agreed to give me an interview, I was inundated with questions and ideas. Here, I hope to have narrowed it down to some the most appropriate - and trust you get an insight into the mind of one of the most popular authors of a generation. 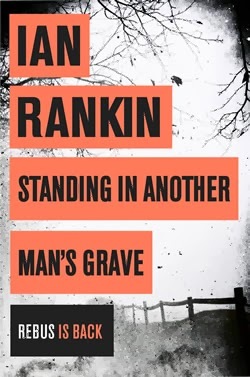 I’ve recently read and enjoyed ‘Standing in Another Man’s Grave’ and for me there’s a sense of security whenever I meet John Rebus again. When you think of Rebus, how do you see him? He’s been part of your life for over a quarter of a century, does a character you’ve known so long get easier or harder to write? · When I invented Rebus, I never thought of him having a life beyond that first book. But he got under my skin, and I began to sense that a cop would allow me to write the books I wanted to write - books about Edinburgh and about contemporary society. So I brought him back for a second book and a third... and a seventeenth and an eighteenth. His longevity is testament to his complexity and tenacity. Each time I write about him, I learn a bit more about what makes him tick. You’ve written several books since Rebus retired. What made you go back to him again after a break? Although Rebus retired from the police, I was aware of a real-life Cold Case unit in Edinburgh and I was sure that's where he would be working - as a civilian, alongside other retired cops. So he lived on in my imagination even after I'd ceased to write about him. Then one day I got the idea for a story that involved an old unsolved crime. It made sense that I give it to Rebus. The first few pages were nerve-wracking though, as I couldn't be sure his voice would still be there. I needn't have worried. He seemed thrilled to be back. 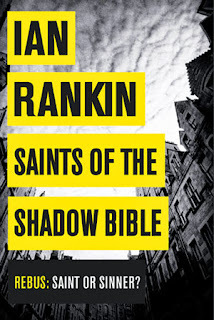 With the publication of Rebus’s 19th novel, ‘Saints of the Shadow Bible’ later this year, how do you keep the storyline consistently up to date and fresh. Does it get easier or harder with longevity? What keeps any series fresh is... well... complicated. If I ever felt jaded writing about my characters, I think it would show in the writing. So far that hasn't happened. Edinburgh remains an interesting place for me to explore, and of course intriguing crimes appear in the media all the time, providing me with inspiration. The likes of Rebus, Siobhan and Fox are altered by the cases they work on, so they evolve from book to book. They are not quite the same in any two books. Disappointingly (for me) books don't get easier to write - they get harder. When I was young, I seemed to be full of plots, storylines, ideas. Now I'm lucky if I get one or two a year. Maybe the well of stories isn't bottomless after all. Location seems to play a strong central role in your books, you once described Edinburgh as a ‘crime scene waiting to happen?’ Why? And what does Edinburgh add to your novels? It wasn't me who called Edinburgh a series of crime scenes waiting to happen - it was Rebus! That's what the city has become for him. Me, I love the place. It is small, compact, but complex. It has its fair share of social problems, plus political intrigues and the like. Visitors get to know one side of it, but my task has always been to expand their knowledge - as well as my own. Larger cities can become confusing or amorphous - but that's not true of Edinburgh. To me it is the perfect Jekyll and Hyde setting: civilised on the surface but seething beneath. Just what any crime writer should be looking for in a setting. You have been lucky to see many of your books adapted for television. What was your involvement with the adaptations and would you have liked more or preferred less? The saga of Rebus on TV is long and often tedious. Fans felt John Hannah too young for the part and were happier with Ken Stott. I never had any involvement - I've never watched it or looked at a script. But I grew frustrated that each book/storyline was being given only 45 minutes of screen time, so that nuance, characterisation, underlying theme, and sense of place were lost. I now have the rights back and am waiting for a TV company brave enough to try Rebus out at a more suitable length - 3 hours plus per book would suit me (and him). I did really like the Doors Open adaptation that was on TV on Boxing Day last year, even though my cameo ended up on the floor of the edit suite! You name your love of Robert Louis Stevenson, and his creation, Jekyll & Hyde - and the search for good v evil, as a major influence behind Rebus. Can you explain more? When I started writing novels, I was a PhD student. My thesis was on Muriel Spark, and I was fascinated by her book The Prime of Miss Jean Brodie. Brodie is descended from William Brodie, a real-life Edinburgh character who was gentleman by day, gang-leader by night. He was a carpenter, and the young Robert Louis Stevenson had a wardrobe in his bedroom made by Brodie. This may have given him the idea for Jekyll and Hyde. He was also influenced by James Hogg's Confessions of a Justified Sinner, an early serial-killer novel. There has always been this dark gothic interest in evil in Scottish Literature, and I began to sense that Edinburgh was still a Jekyll and Hyde city, a city suited to contemporary crime fiction. No one was writing it, so I started. It seems to me that the central question in crime fiction is: Why do we continue to do bad things to each other? What sets us on a certain path in our lives? Stevenson was one of the first novelists to tackle that. 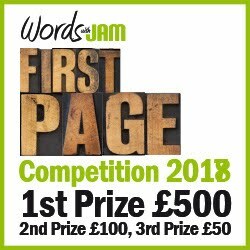 What crime novel would you have liked to have written, and why? There are so many crime novels I wish I'd written. They include Elmore Leonard's Glitz and James Ellroy's White Jazz, and Silence of the Lambs and (more recently) Gone Girl. I did learn a lot from Ellroy, and the style, structure and language of my novel Black and Blue is testament to this. I'm not sure I have any words of wisdom to impart to the next generation of crime writers. Best if they find their own voice and their own way of doing things. The worlds of publishing and reading are changing so rapidly, I'm not sure any of us know where we'll be in 5 years. I do sometimes tell aspiring writers that they have to read a lot, and have to become self-critical. They have to be ready for rejection but have confidence in their abilities. They need to write lots. And they need to get lucky. The CWA Gold Dagger for Black and Blue stands out for me. I was a mid-list author. I'd published a dozen books and none had bothered the bestseller lists. That just made me more stubborn, but I knew the omens were not good. If my career didn't pick up, I might have no career at all. Winning gave me confidence, and it gave my publisher confidence. Black and Blue sold four times as many copies as my previous books, and a couple of titles after that I was having my first UK number 1. So I remember that night with great fondness. One little secret I'll let you in on: I was presented with the Silver Dagger by mistake that night. Never having seen the award before, I'd no idea. But a few months later the error was rectified. The Gold Dagger was altogether chunkier and more splendid! Well, I have one more book coming out in November, plus my first stage play - a thriller - opening in Edinburgh in September. But I plan to take next year off. No new book, no significant new projects. Maybe even no interviews. Great interview. I met and interviewed .rankin many moons ago at a Bouchercon as he was just rising the wave of becoming known here. I remember he mentioned how his family affected his choices, too. Having a child in a wheelchair put Rebus' daughter in one for a time. His books continue to provide great reading. My Edinburgh wife and I attended Ian's presentation at the Edinburgh Book Festival several years ago. At that time I was in the process of reading all his Rebus books. I mentioned to him in a tweet that I started with Fleshmarket Close and read from there to the last and started reading the early books. He suggested I read them again starting from the first to last. I've done that and am glad I did. Although a wee bit difficult for this New Scot (Yank living here since 2001) I got into the books and have always been delighted to see the actual locations Ian used in his books. He's a tribute to not only Edinburgh, but to fans of well written literature as well.